Is chronic back pain caused by the manner in which we sit? For many people, this could be the case, according to a growing number of experts in the field of ergonomics. Add to this the fact that we are fast becoming an information processing society, in which increasing numbers of workers transact business while sitting for long periods of time, and we begin to see the crucial role that sitting may play. For modern researchers, many of the ideas proposed two decades ago by Danish surgeon, A.C. Mandal, M.D., regarding the spine began a major paradigm shift in the way we evaluate the seated worker. Many of these ideas have been validated in more recent studies. 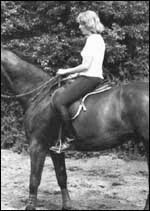 Simply put, Mandal believed that the century-old concept of proper sitting - upright with a hip angle of 90° - was all wrong. 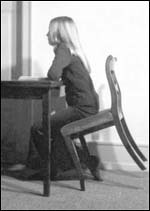 This type of traditional sitting, still practiced today and considered by many to be the one proper way of sitting, is now known to decrease lordosis (the natural or inward curvature) of the lumbar region of the spine, and increase kyphosis (or an outward rounding of this region of the spine). 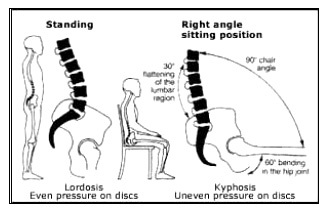 This is exactly the opposite of what we need, in terms of posturally healthy sitting - we should avoid kyphosis in the low back and maintain a moderate level of lordosis. For us, this would mean incorporating the natural curves of the spine into our seated posture, neither flattening nor exaggerating these curves. When standing erect, the spine assumes a posture of natural lordosis, while kyphosis is difficult to avoid in traditional seated postures. Virtually all experts now consider a proper degree of lordosis in both sitting and standing postures to be critical in maintaining a healthy spine. The erect spinal posture tends to collapse as the upper back bulges out, leading to a posture that may encompass shoulder, neck, and back muscle tension, misaligned vertebrae, and a rounding of the low back (kyphosis). The circulation in the lower extremities weakens, possibly leading to varicose veins, cellulite, bloated feet, fatigue, and a risk of blood clotting in the legs. When we sit for long periods, we also expose much of our body to the effects of static loading, which can result in fluid loss to the spinal discs, and can quickly fatigue muscles. Try sitting all day at a seminar on one of those easy to stack chairs that hotels always seem to provide at such events, and see if you don’t feel seriously fatigued by the end of the day. Mandal emphasized a way of sitting where posture approached the spine’s natural resting position. He called this balanced sitting. A hip angle of 135°, or a forward seat pan tilt of 45°-55° from the horizontal creates the optimum balanced posture for the low back, to the point that a backrest is no longer necessary. Research shows that in this half standing posture, spinal disc pressure is at its lowest. This seemingly radical concept is not new, however. Going back to as early as 3100 BC, for example, there is evidence that forward tilt (of the seat pan) and, later, reclined forms of seating, were used by both nobility and craftsmen. The purpose appears to have been both for comfort and to enable them to get closer to their work. The Standard Office Chair, with a forward seat pan tilt adjustment feature. Kneeling Chairs, a Norwegian design from the early 1980’s, where the weight of your body is supported by knee rests. The knock on these is that many people end up with knee problems after extended use. Sit/Stand Stool these allow a near-standing posture, but are generally only used to provide some support to workers who must stand when performing their jobs - like cashiers, for example. Saddle Chairs, where you sit equestrian-style with no back support. Of these, probably the easiest to adapt to your workplace is the standard chair with the forward seat pan tilt. Unfortunately, only a small percentage of chairs offer this adjustment, and those that do generally don’t tilt far enough to achieve the desired effect. Also, users who do try this technique generally complain that they feel like they are sliding out of their chairs. The desk or work surface height usually needs to be raised to put the user into an optimal position, and to avoid introducing a new ergonomic problem into the mix. Tight skirts are not possible, due to the wide stance required, and loose clothing is recommended. A short break-in period is required, which may include some sore muscles for a few days. Apparent ease at maintaining the hollow of the low back in a balanced posture (lumbar lordosis). Improved circulation to the lower extremities, resulting in, among other things, less fatigue. As the upper body stays more relaxed, muscle tension is minimized. Excellent mobility - it is easy to move around on the chair, reach for items, and getting on and off the chair is effortless. Fairly adaptable for standing-height work as well. Only time - and future research - will tell if some of these new concepts in seating hold true. But finding a posturally healthy, balanced way of sitting seems to make a lot of sense. The ancient Egyptians learned this, but apparently history forgot. For the sake of our backs, let’s hope that we don’t. Mandal, A.C. “The Seated Man”, (homo sedens). Dafnia Publications, Klampenborg, Denmark. 1985. Pynt, J., et al. “Milestones in the Evolution of lumbar Spinal Postural Health in Seating”, Spine, Volume 27, Number 19 (2002):2180-2189. Peters, H. “Report by the German TUV”, http://www.mindcom.fi/easydoing/english/default.htm, 2002. Saukonpaa, H. “Extracts from the thesis of physiotherapist, Helena Saukonpaa”. http://www.mindcom.fi/easydoing/english/default.htm, 1994. Koskelo, R., et al. “University of Kuopio study for high school students”, http://www.mindcom.fi/easydoing/english/default.htm, 2001. Information or recommendations contained in this article were obtained from sources believed to be reliable at the date of publication. This information is only advisory and does not presume to be exhaustive or inclusive of all workplace hazards or situations. Our industrialized society is transforming into an information processing society in which more employees are transacting business while sitting for long periods of time. With the advent of the information processing age, it is becoming increasingly clear that there is a significant mismatch between people and the furniture in their working environments, as is evident from the increasing numbers of employees suffering from chronic backpain. The most likely explanation is that we are sitting in the wrong way, thereby abusing our backs, necks and arms. For the last century, work chairs in schools, factories and offices have been designed for sitting upright, with the hip, knees and ankles all at right angles. Untill recently, it was widely believed that people sat with a 90-degree bending of the hip joint while preserving lordosis (concavity) of the back. The erect posture looks very nice, but it is impossible to sit this way for long and there is no scientific basis for it. It is entirely based on wishful thinking, morals and discipline from the days of Queen Victoria. This erect sitting posture cannot be maintained for more than one or two minutes, and usually results in fatigue, discomfort and poor posture. In 1962, the German orthopedic surgeon, Hanns Schoberth, demonstrated by x-ray photos that in a seated work position, you can only bend about 60 degrees in the hip-joints, not 90 degrees as shown in the drawings in fig.1. This means that when moving from a standing (lordosis) to an upright sitting position, you bend the hip-joints about 60 degrees and rotate the pelvis axis backwards, flattening the lumbar-curve (kyphosis) of the back 30 degrees and straining the muscles of the back. (fig.2) When leaning forward over the desk, you have to bend another 40-50 degrees, and this bending mainly takes place in the 4th and 5th lumbar discs. 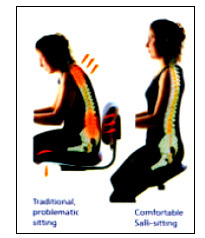 Even the best lumbar support will hardly have any influence on the posture when leaning over the desk. A sitting posture that approaches the natural resting position (b), is a more suitable position and allows the spine to carry the body weight in a more comfortable way. This is "Balanced Seating". A seat that tilts forward encourages this natural posture. Opposing muscle groups are balanced and the lumbar curve is preserved producing balanced seating in which the back is straight, the joint angles are open and the muscles are relaxed. This position provides greater mobility and relieves pressure on the lungs and stomach. To further evaluate the effect a forward tilting seat has on the flexion, forward bending, of the back, I conducted an experiment to document the results. To record the changes in the flexion of the various parts of the body, the anatomical points were marked at the knee-joints, hip-joints, 4th lumbar disc and shoulder joints. The participant was seated at a fixed height for the seat and work surface, but the feet were placed incrementally in three different positions in order to simulate different work heights, and the seat and work surface were tilted. 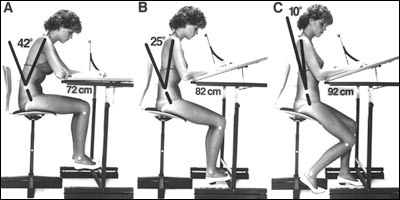 To begin with, the girl was positioned at the conventional right angle (Fig.6), whereupon the chair seat and work surface were tilted incrementally and the position of the feet lowered to simulate an increase in the chair and work surface heights (Fig.7 & 8). Fifty photographs of each of 3 positions were taken during a period of 10 days to record the changes in the flexion. The findings were significant. Flexion, forward bending, in the hip-joint and back was greatly reduced, preserving lordosis in the lumbar region. The final position (Fig. 8) with feet lowered simulating even higher seat and work surface, is exactly the same as the natural resting position where the muscles are relaxed and the body is in a perfect posture for "Balanced Seating", the most suitable position for long periods of sitting. Front seat tilt and higher work surfaces are valuable alternatives that can eliminate lower back strain and ultimately prevent chronic backpain. In this half standing position the disc pressure will of course be very low (Lelong 1986). Furniture should be designed to accomodate the natural resting position, in which opposing muscles are well balanced. The resulting posture will enhance the performance, efficiency and wellbeing of employees. The recommended chair height is one-third of the person's height, and the desk height one half. Most people with back pain will find this very comfortable, but for the first weeks you will only be able to sit like this for 5-10 minutes, because your back muscles need training. You may also reduce the tension of painful tendons and muscles of the back by moving to the front of the seat of a traditional chair or by using forward-sloping cushion. Most desks are far to low, and this may be improved by placing wooden blocks under the legs. Mandal, A.C.: Work chair with tilting seat, Ergonomics, Vol. 19, No 3, p. 157. London 1976. Mandal, A.C.: The Seated Man (Homo Sedens), Applied Ergonomics, 12.1, p. 19. Oxford 1981. Mandal, A.C.: Correct Height of School Furniture, Human Factors (USA), 24 (3), 257. 1982. Mandal, A.C.: The influence of furniture height on backpain, Behavior And Information Technology, No 3, 247. London 1987. Mandal, A.C.: "The Seated Man" (homo sedens). Dafnia Publications, Taarbæk Strandvej 49, Klampenborg, Denmark. 1987. Prices and configurations are subject to change without notice or obligation. We take special care to show correct specifications, sizes and weights and such descriptions, whilst given as a guide in good faith, are subject to modification as part of our on-going product development programme. Sitting-comfortably.co.uk sell on a 'Business to Business' basis and deal with individuals working in partnerships or as sole traders, public, private and voluntary sector organisations. The equipment is specifically designed for expert use by professionals and it is a condition of sale that the purchaser is such a professional practitioner or an organisation. This includes students on professionally recognised courses completing the practical treatment phases of their training. copyright © 2009 sitting-comfortably.co.uk. All rights reserved. Sitting-comfortably.co.uk is part of the Beautelle Group of Companies... for all your specialist equipment needs.